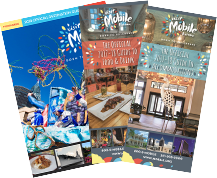 For any business that may benefit from the convention and tourism industry, Visit Mobile is here to help. We provide our partners with a wide range of services, opportunities and tools designed to maximize your exposure to this lucrative audience. Whether you represent a hotel, restaurant, entertainment venue, shop or any business that a tourist might be interested in, we are here to help your business grow. Below you can find our Partner Directory, partner brochure and application, find out how to get listed on our web site and more!